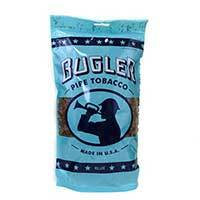 Bugler Pipe Tobacco is an extension of their cigarettes, but features the same quality tobacco. Made with fine flue-cured Virginias and air-cured Burleys make for a smooth smoke from start to finish. The two tobacco blends are skillfully blended and the result is a rich flavor that your taste buds will crave. However, Bugler Pipe Tobacco has a mellow character that won’t overpower your senses. You’ll get a stratifying smoke time and time again. The company seeks to set a new standard for pipe tobacco and they’ve done it with this excellent blend! The non-aromatic pipe tobacco has been a popular brand in the U.S. for decades, which is why many turn to it for their smoking needs. With only two options, you get quality tobacco with both blends. The Bugler Pipe Tobacco Green features a refreshing menthol flavor that provides a fulfilling taste that will last throughout your entire smoking experience. It burns just right from start to finish! Bugler Pipe Tobacco Blue is their classic blend and hast a rich and mellow flavor that’s perfect for a smoke just about any time of day. But really, you can’t go wrong with either flavors!